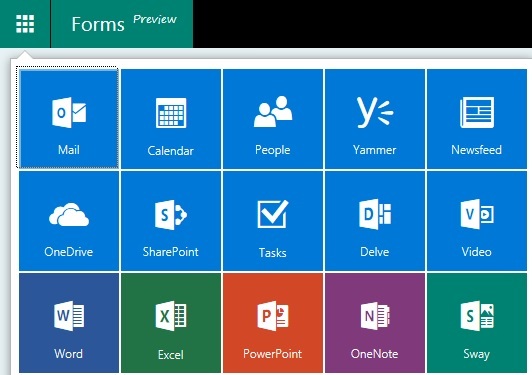 So just a little over a month ago, Microsoft released it’s latest app, Forms, into it’s ever-expanding array for the ‘Office365 for Education’ platform. MS Forms was developed as a result of feedback (via a form?!) from various educators who were looking for an easy way to collect simple data, produce quizzes and be able to analyse student progress. Initital impressions from users suggests that MS have delivered a neat product indeed! Once logged in, you are presented with a really clean and very intuitive interface. The design allows for forms/quizzes to be created very easily and within a matter of minutes. There are a few themes to choose from to personalise each form too. Forms can be restricted to either your organisation, or it can be made public. If it’s restricted to your organisation, then users must log into Office365 before they will be allowed to fill out the form. This of course means that the submissions will not be anonymous – though, results are only seen by the creator of the form. Conversely, if the form is set to be public, then users are able to fill in the form without having to log into Office365 and hence the submissions are completely anonymous. Forms can be sent to users via a URL, email, QR code or embedded into a website – all of these are auto-generated via the Form itself. Responses are seen instantly by the Forms’ creator, although at this stage there is no email notification to say a response has been received. Instead, the creator needs to log back into the Forms site to see the response. Forms also allows an Excel document to be created with the results. Very handy if users wish to create graphs with the results obtained. On the whole, it looks like a very good tool to have as part of the Office365 suite. I can definitely see many teachers adopting it as way of generating some really quick tests for their pupils. The lack of a Captcha feature – if the form is set to public, the lack of a Captcha will leave the form open to abuse. The method of tracking responses is via the number of answers, and not the number of users who have submitted. Just to illustrate that 2nd point a little further, here is an example. Question 6 was optional, and only the 3rd user filled the answer in, yet, the ID is shown as 1 and not 3 (as I would have expected). If the ID was based on the user (and not the answer), this would allow tracking the “optional” responses more dynamically. So in this example, Mr Berry had filled out the optional question – if this ID was number 3, then all questions which had answers with ID 3 could have been collated together so that Mr Berry’s overall feedback could be discussed with him. If MS can sort these 2 little niggles then I think this would have been a very solid addition to Office365. My test form is at the bottom of this blog for anyone interested in what the embedded form looks like or wanted to have a play too. Anyone who submits the form will be added into the fictional prize draw to win the non-existent iPad mini, too! Good luck!